Establishing a tidy, if uncommon, structure, Araby, has something commendable to say about life on the streets and the hardships of getting and maintaining a job in Brazil. To tell their message, the pair of directors, João Dumans and Affonso Uchoa, take us to a smoky little town in Ouro Preto, state of Minas Gerais. There’s sadness all around and elderly people needing care. This is the village where Andre (Murilo Caliari) was born, a solitary teenager who is neglected by his ever-traveling parents. He takes care of his sick young brother with the help of an aunt, nurse Marcia (Gláucia Vandeveld), and seems to have an erratic personal life. When we thought Andre would be the central character of the story, the camera shifts its focus to Cristiano (Aristides de Sousa), a hardworking ex-con who is employed in the old metal factory, guarantor of the town's financial stability. After a serious work accident, Cristiano is taken to the hospital and remains there unconscious. During this time, Andre goes to his place to get some clothes and finds a handwritten notebook with descriptive points of view and past episodes of Cristiano's life. Memories and states of mind were tossed in those pages, and that’s how we get to know more about a humble man who once had to steal to eat. He worked in a variety of fields - from civil construction to fruit picking to weaving factory - and stained his hands with blood, although, in an involuntary way. Yet, nothing had been so insuperable to him than experiencing disillusionment in an amorous relationship. The last pages reveal how tired and consumed by frustration he was. 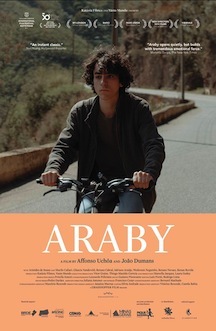 Toggling between the feverish and the vulnerable, Araby is contemplative in the tone and depressive in the message. Its shots are unconventionally composed and some of the sequences are roughly edited, displaying live acts of Brazilian folk music that linger for quite some time. It has a penetrating narrative spell, though, that puts us in a sort of trance. Even with all its flaws, you will be moved by its humanity, but don’t be surprised if a deep feeling of solitude invades your spirit.